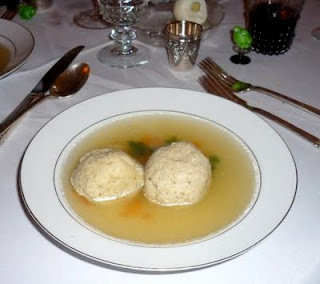 Here is the tale of Golda-Lox and the three dozen Matza Balls. Nice Jewish girl is in charge of making the seder. She makes a batch of matza balls, but they were TOO hard. Nobody really likes very hard matza balls. So, she tries a different recipe. She mixes them, and chills them, and boils them,but this time they came out TOO soft. They just turned to mush! What to do? Being a crafty girl she adjusts the amount of matza meal, and, lo and behold, her matza balls were JUST RIGHT. Beat eggs slightly, stir in chicken fat, gradually add matzah meal. Stir in the soup. Add salt and pepper to taste. Cover tightly with plastic wrap, and refrigerate at least 4 hours or up to 24 hours. Moisten hands with water, and shape walnut sized balls of the mixture gently, not compressing them too much. Drop into the salted, boiling water. Cover the pot tightly, reduce heat to slow simmer, and cook for 25 minutes. DO NOT REMOVE THE COVER OF THE POT while they are cooking. Don't let the water boil too vigorously, or they will fall apart. They freeze well, or can stay tightly covered in fridge for 2-3 days. I like to add a couple tsps finely chopped parsley, but some people don't like the look of the "flecks".